Most Tarot Readings answer questions about a specific situation. I specialize in Career, Finance and Relationship readings. Sometimes you have a question about an aspect of your life, or there is a situation that you are facing and want some insight on what to expect. Tarot is the tool I use to help show you what is happening and provide guidance on how to move toward the life that you want. Readings can be done in person, over the phone, via Skype, or through email. If you are in the Northwest CT area I'll be happy to do the reading in person. I can come to you, you can come to me or we can meet in the middle at an appropriate location. From Winsted to Waterbury, Goshen to Granby, there are a lot of places we can get together. Email, use the appointment page, or call me and we can arrange the time and place! If you would like a reading for you and two or three friends, we can arrange that too! If you're not in the area, we can set up a reading by phone or via Skype. Readings are $25.00 for twenty minutes or $45.00 for forty minutes, and you can schedule the reading online. The appointment page will allow you to choose the best date and time available that fits your schedule. Email readings are designed for the seeker who isn't in a hurry to get the reading, or who wants the reading in an audio file that they can refer to it later. The reading I send back to you will have links to images of the spread and an MP3 audio recording of the reading so that you can access them from whatever device you are using. Use the button below to submit your question and payment, and I will have the reading to you within 48 hours. Since there is not a way to ask questions during the email reading, I encourage you to refelct on the reading you get and then ask any questions that it brings up. I'll be happy to follow up with you as if we had been sitting together for the reading. For instant phone readings you can contact me by clicking the button below. If the button shows I am not availble, you can use it to request a callback or to schedule a phone reading. A General Tarot reading is designed to show you where you have come from, where you are today, and what you can expect to see coming your way in the near future. These readings generally provide some options on how to approach the next few months. In a General Tarot Reading we look to see what the cards show and then look into that aspect of your life a little deeper. 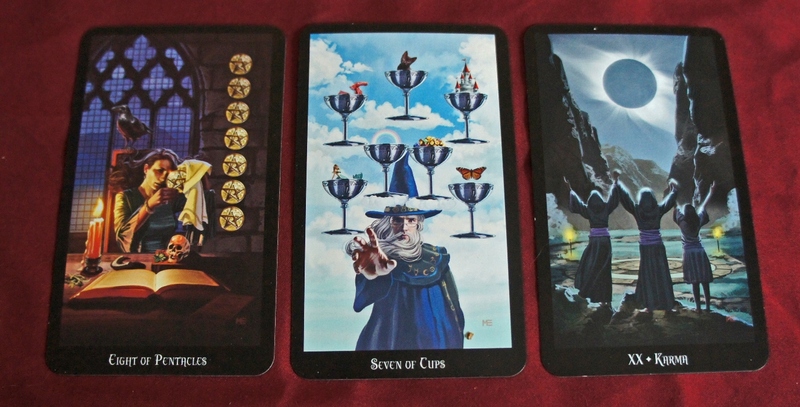 In most cases we will work with two or three different spreads as we examine what the cards have to show us. Tarot Readings do not predict the future. Tarot is a divination tool to look into the future that may come to pass but that future is not set in stone. One of the most fulfilling aspects of Tarot Readings is helping people see what they can do to change or enhance an aspect of their life, and watching how that helps them over time. The questions you ask can be as open or as focused as you want, but one suggestion is to start the question with "how" or "what" and go from there. "What do I need to know before I start a new job search" is a more empowering question than "Will I find a good job". "How can I improve my chances of getting promoted" is a better way to ask "Will I get that promotion". Keep the questions positive and focused on yourself, and they will help provide guidance that you can use to achieve your goals.